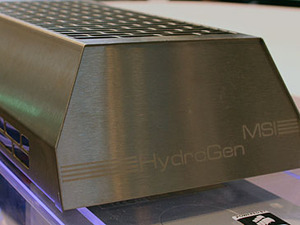 First up – MSI’s HydroGen was on display and seen in action. 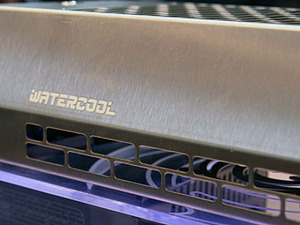 Plugged into its X48 board the watercooling heatsink that covers the south bridge, north bridge and power regulation components looks as gorgeous as it does in the presentation slides. Even the external cooling that sits on top, while an engineering sample still, looked fantastically well constructed with clean lines and a brushed aluminium finish. While we couldn’t tell noise levels on the loud show floor, the air coming from the two 120mm fans was nice and warm. This was to be expected though considering the system was a generous QX9770 with CrossFireX running on a pair of Radeon HD 3870 X2s that were also watercooled with custom, German fabricated blocks. Unfortunately, this product might only be available in Germany or EU only – the company that makes the blocks can’t commit to worldwide sales because it just doesn’t have the capacity. Shame! 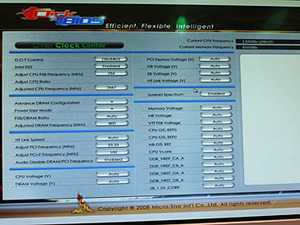 We did suggest that it was maybe a special order only item, but then you get into the problems of warranty and installation issues, MSI told us. EFI was back on the cards and being shown off, or, at least a Flash mockup of what it will look like. We were assured that there will be multiple themes on offer, or you can turn them off entirely so it’s nice and simple. The buttons and options were well placed and it looked incredibly intuitive, and will likely be revolutionary for those afraid of the BIOS, although we’ll have to wait to see the final product to know exactly what we’re getting. 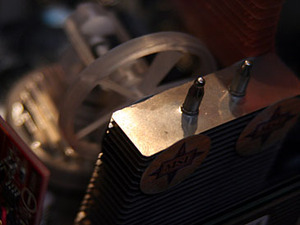 Finally we got some more shots of the Sterling Engine, although because of the temperature difference between Taiwan and Germany, the system setup in the Far East that would run the fan, would not run it here in SchneeBit. Even though it wasn’t running, it’s still a nifty bit of kit. 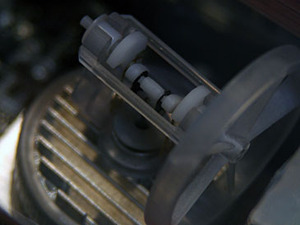 The small pump turns a crankshaft which then turns the fan – it's simple and clever with almost a mechano-esq engineering style to it. 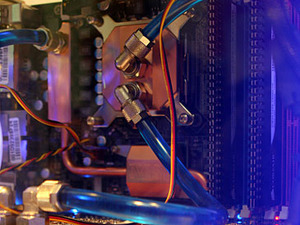 We asked about a CPU cooler based on the design and were told that it was certainly considered, and the greater heat output would be more appropriate, but chipsets often have a higher TDP and users often wanted to control fan speeds or aim for better cooling that it could offer, as it would typically sit at higher temperatures by default. It could be used in some applications like home theatre and OEM integration, but MSI wouldn’t comment further on pure speculation.